Find houseware, glassware, cookware, bakeware. California Wholesale kitchen equipment stores list. Find California kitchen / restaurant supply stores in your city. Warehouse, office and outlet store address. Find quality cookware brands for your kitchen : All-Clad Cookware, Amoretti Brothers Cookware, Calphalon Cookware, Cristel Cookware, Le Creuset Cookware, Mauviel Copper Cookware, Scanpan Cookware, Swiss Diamond Cookware, USA Pan Cookware. View All Cookware Brands. 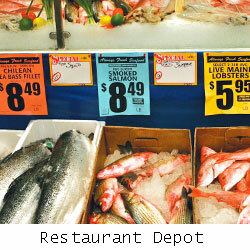 Located in Anaheim, CA – Restaurant Depot is a wholesale cash and carry food service supplier since 1991. [California, Southwest & Northwest]. A full range of fresh, frozen & dry foods, beverages, dry groceries, paper goods & cleaning supplies and equipments. 1265 N Kraemer Blvd., Anaheim, CA 92805. 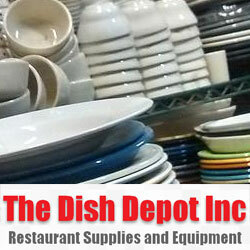 Located in Los Angeles, CA – Dish Depot is a restaurant supply store. Dishes, glasses, silverware, appliances, cleaning products, sanitizer, glass cleaner, TISSUE paper, bleach, all types of food serving baskets and many more items. 546 W Garfield Ave, Glendale, CA 91204, United States. Beverage Despensing Equipment (Wunderbar Bar Guns, Gas Tanks, Racks & Pumps, Carbonators, Mobile Bars). Bar Beverages LA provides professional installation support. Local company servicing bars, restaurants & nightclubs in Los Angeles County. LA Ovenworks offers Italian wood fired pizza ovens for home and backyard. The Los Angeles Ovenwork’s warehouse / showroom at Santa Fe Springs, CA. Italian wood burning brick ovens for home and restaurant. Wildwood Ovens designs and manufactures UL/CA listed wood fired pizza oven, pre-cast fireplace, Brazilian BBQ (churrasqueiras) and Japanese style yakitori BBQ’s.